The contracting out of government functions and services to external providers is an established practice in many developed and developing countries. On the one hand, it can offer essential support to states that have to deliver basic services urgently; on the other, it risks bypassing governments and undermining their long-term recovery. The OECD’s Partnership for Democratic Governance was formed in 2007 to gather evidence on this issue.This handbook does not take a view for or against contracting out; nor is it a technical manual. The handbook is for field practitioners and government policy makers in countries that are either emerging from conflict or are otherwise considered to be fragile. Its aim is to help them make more informed choices about the types of contracting that are best suited to their country. 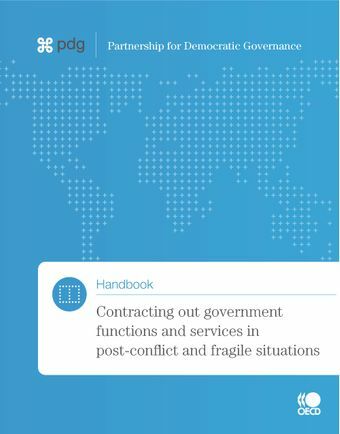 It is a tool to assess whether contracting out might be a possible way forward – either temporarily or over a longer period of time – for delivering a core service (such as basic education, healthcare, water and sanitation) or a government function (such as managing public finances and human resources). The handbook illustrates these points with the aid of case studies ranging from Afghanistan to Haiti and Liberia.